This balloon rides site is easy to find just off the B1024, close to Colchester, the oldest recorded town in England and famous for its zoo and its castle. Our balloon ride launch site at Earls Colne has just a little bit of prior aviation history to it! 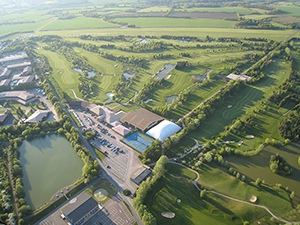 Our take off field adjoins the Earls Colne airfield and Golf Course but its life as an airfield started in 1941. Construction of the aerodrome just south of the village began as part of a huge bomber-airfield building program throughout East Anglia during which time 27 military airfields were built. Flying Fortress. B-17 bombers were Earls Colne's first US residents. Its main runways and perimeter track are still "tarmac" so you will easily be able to identify the shape of the airfield as you rise up from the launch site. As part of the airfield’s construction the nearby country house at Marks Hall, less than a mile south west of the airfield was requisitioned for use as the headquarters of the airfield. Today, within the gardens and arboretum open to the public at Marks Hall there is a memorial to all the air crews that flew from Earls Colne. It stands within a grass clearing mown to represent the airfield's three runways. 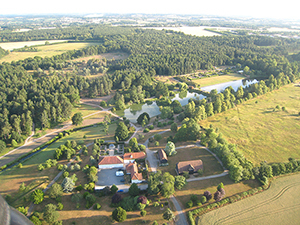 Although the original Jacobean mansion, having done its bit for the war was demolished due to disrepair in 1950, the 200 acres of trees from temperate climates in the arboretum are a delight to the eye as you look down from your hot air balloon ride in Essex. 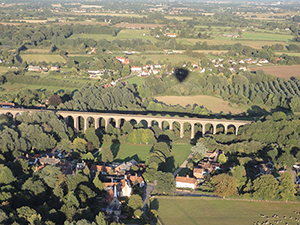 As you rise up on a balloon flight from Earls Colne, look in the other direction east towards Colchester and you will certainly have a great view of the Chapple Viaduct about 2 miles distant soon after your take off. A listed building and the second largest brick built structure in England, (the first being Battersea Power Station) Chapel Viaduct is situated near Wakes Colne in Essex off the A1124 Colchester Road and spans the picturesque Colne Valley. Trains on the Sudbury to Marks Tey line operate daily, connecting with trains to and from London's Liverpool Street Station along the main line. Built between 1847 and 1849 it used 6 million bricks and is over 1100 feet long and 80 feet high at its highest point, nearly as tall as the hot air balloon you will fly in.